The Mobile Phone Battery Charger down-converts 220-240V AC mains supply to 9V AC with the help of a transformer (X1). The transformer output is rectified by diodes (D1-D4) wired in a bridge configuration and the positive DC supply is directly connected to the charger’s output contact. Build this circuit and charge your mobile hassle free. A LED (LED2) works as a power indicator with a resistor (R1) serving as the current limiter while another LED (LED3) indicates the charging status. During the charging period, a 3V (approx.) drop occurs across a resistor (R2) which turns on the LED (LED3) through a resistor (R3). An external DC supply source (for instance, from a vehicle battery) can also be used to energize the charger, where a resistor (R4) and a diode (D5), limits the input current to a safe value and provide for polarity protection respectively. 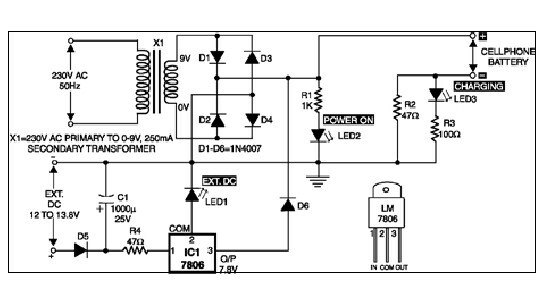 A 3-terminal positive voltage regulator IC LM7806 (IC1) provides a constant voltage output of 6V DC. Since LED1 is connected across the common terminal (pin2) and ground rail of IC1, the output voltage is raised to 7.8V DC. LED1 also serves as a power indicator for the external DC supply.